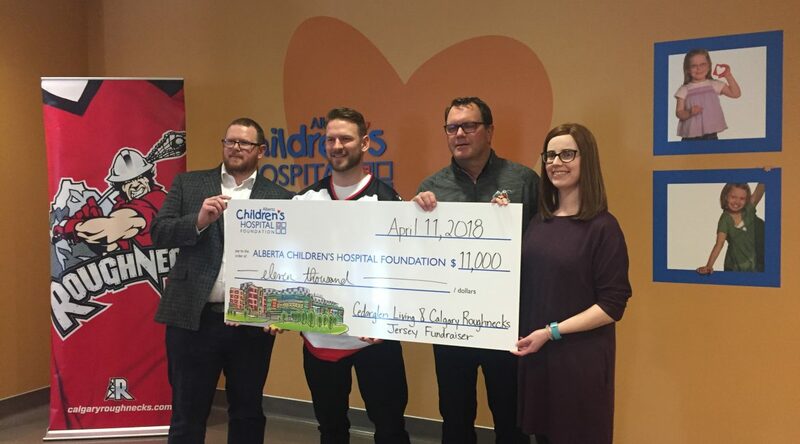 The Calgary Roughnecks Lacrosse Club, in partnership with Cedarglen Living, is proud to announce an $11,000 donation to the Alberta Children’s Hospital Foundation from funds raised through the St. Patrick’s Day-themed jersey auction held at ElevateAuctions.com. The Roughnecks donated $5,500 which was matched by Cedarglen Living. The limited-edition jersey was true to the original jersey design, but featured a distinct Irish flare with the caricature’s outfit in the logo, the font of the name bars and shamrocks on the shoulders. This unique jersey made its one and only appearance of the 2018 National Lacrosse League season on March 17 when the Roughnecks hosted the Rochester Knighthawks in the team’s first St. Patrick’s Day Party presented by Cedarglen Living. The Roughnecks have been an active partner with the Alberta Children’s Hospital since 2015 through player appearances, autograph signings and donations. The Alberta Children’s Hospital Foundation is the official fundraising body for the Alberta Children’s Hospital. All money raised by the Foundation is re-invested in the hospital and child health needs in this region. The Alberta Children’s Hospital Foundation inspires our community to invest in excellence in child health, research and family centred care.